Robin DeFago, revenue cycle director in patient accounting, is retiring after 40 years. For years, fortune has favored Robin DeFago, revenue cycle director in patient accounting. It started when she took a chance on herself and landed at Children’s. At the hospital, good things kept happening to Robin, such as earning a college degree and leading teams that automated the multiple ways the hospital generates revenue. 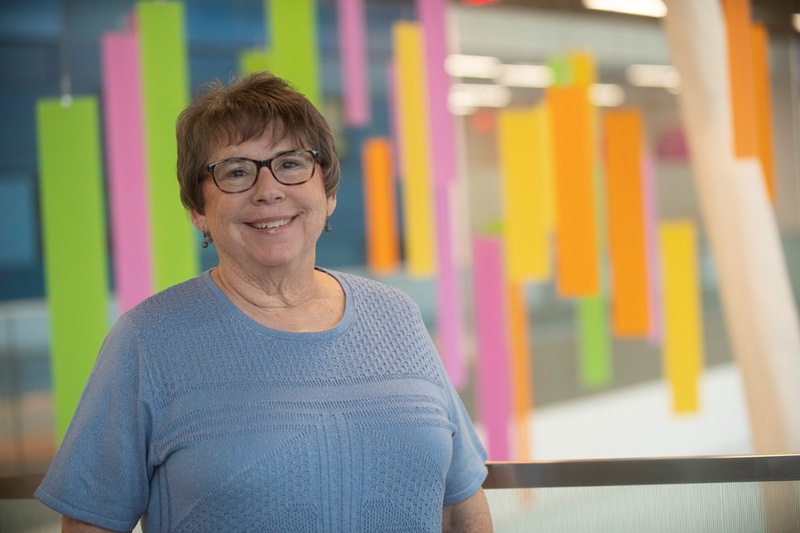 Through humor and determination, Robin overcame setbacks, built enduring relationships and facilitated positive changes at Children’s. I worked for a private practice physician my first 10 years out of high school. Although I loved my job, I knew my boss would eventually retire. Instead of waiting to start over, I looked for a new job at a larger company, hoping to meet new people, conquer new challenges and, if I was lucky, stay until retirement. I applied at Children’s and Janice Gray in patient accounting hired me for a temporary position. A few weeks later, another company offered me a permanent job. After I gave Janice my notice, she told Ward Sales, former chief financial officer. The next day, Ward and I talked, and he asked what he could do to encourage me to stay. When I told him I needed a full-time position, he said, “Then you have one.” I’ve been so lucky these last 40 years! Initially, I handled medical billing and insurance follow-up in patient accounting before Janice Gray offered me a newly-created assistant supervisor role 7 months later. We began transitioning from paper-based financial activities to computerized and automated claim form processes. I worked with multidisciplinary hospital teams to ensure the integrity of our charges and payer claims, eventually becoming an internal auditor for almost 25 years. In 2008, I became revenue cycle director, helping patient families resolve claims and negotiate insurance bureaucracy. The first was surviving the flood of September 2008, that was caused by a ruptured water main. It flooded the information technology (IT) center in the Considine Building and took out our patient, financial and accounting software systems for about 1 week. The effort to regain our functionality was massive, exhausting and extensive. The second was the preparation, transition and oversight of patient financial records within the Epic system. We’ve advanced technologically, but what hasn’t changed is our culture and making a difference in the lives of the families we are privileged to serve. It seems to happen when I’m feeling frazzled and come across a lost visitor. I stop to help them find their way. It always reminds me of what’s really important inside these walls. I was married, and wanted to start a family but after several years of trying, it seemed doubtful. I began planning my life around my career and being childless. Six months after I started at Children’s, a pregnancy test came back positive! I worked closely with a young hematology patient’s family and their insurance company while he was being treated. He eventually passed away. His mother sent me a beautiful bouquet with the most heartfelt message to thank me for allowing them to concentrate on her son while I dealt with insurance details. It was a powerful reminder of the impression and impact we make in our patient families’ lives. Finishing just one thing that’s on my to-do list. Make yourself indispensable by listening, learning and remembering that you are here to make a difference for the children and families we serve. What’s the last move you saw? Recharge by spending time with my family and friends, reading, watching college football or walking.